When it comes to late Autumn and the cold weather starts to bite, lots of us start to move to comfort food to keep our kids warm on cold days and put some good solid food into their bellies. Making roast beef and then later adding all the trimmings is something that we can all do easily and make as healthy or as unhealthy as we want it to be. Even adding something as simple as a Yorkshire Pudding can make it a dish that everyone would love to sit down to. Getting roast beef cooked properly is actually easier than most people think it is. Once it’s cooked, it can be used for a full meal, with salad, mashed, roast or boiled potatoes, or even sliced and added to sandwiches for a fabulous packed lunch. I’d personally choose a rib of beef or a fillet to roast, but there are other options. Beef should look mature and have been well hung. There should be some fat to allow for flavour and to keep the roast moist while it’s cooking. It can be cut off before it is served up. There should be some marbling through the roast to help keep the roast moist. I’d recommend going by the times of your cooker as they can change, or be different from cooker to cooker. As a general rule of thumb, a very hot oven around 220C to start off with for the first 30 minutes in a pre-heated oven. Lower the temperature of the oven for the rest of the cooking time to about 190 – 200C. I check my meat by using a thermometer and put it right into the thickest part of the meat. Rare – (130-140F) The middle of the meat is a bright red hue and pinky towards the outside. Medium – (145-150F). The outside of the meat will be brown with a pinky centre and the roast will be hot. Well Done – (160-175F) As we prefer our meat well done here, I am usually looking for my roast to be brown throughout. These cooking times and heats are a guide for example only. Guide temperatures can change depending on who is cooking and the roast you have picked. Make sure you follow manufacturers and suppliers instructions to make sure your meat is safely stored, cooked and eaten. Rest your beef for an hour before cooking it. It should be roasted in a tin big enough to catch any juice drip that might happen. Completely encase the roast in tin foil and loosely close it. Once the meat is cooked, it again needs to rest. Use the aluminium foil and make a loose parcel shape over the top and leave the roast to rest for about 15-20 minutes to get the most out of the meat. Pour off any excess juice for making gravy and your roast is ready to carve and serve with your accompaniments. « Drinking When Pregnant: Woman refused a glass of wine by barman. I’m often wary of roasting meat in case I don’t cook it properly. Perhaps I should try more often. It’s actually really easy as long as you remember it’s in the oven…. 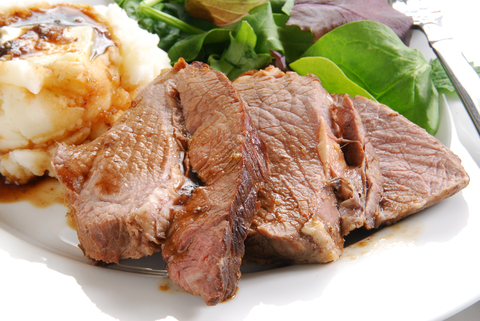 Great blog and a really great exact recipe, I can imagine the texture and roasty taste! You should post some good ideas about what to do with left overs. I like to take left overs to do something chinese (double roasted meats with fresh vegetables or mushrooms). We are providing gourmet food hampers with rare products from European artisan food producers, maybe you would like to share some vacation like food experiences. Thank you. It’s worth trying and leftovers is always good to talk about. We rarely have any here as I have 6 to feed, but it is worth thinking about.